This is actually the second cut but I can't find a photo of the first cut. As the principle is the same you can follow from this. Place your ruler onto your fabric near the edge, lining up the edge of the ruler with one of the line markings on the mat. Hold the ruler down firmly and while pressing down cut away from yourself. For a more accurate cut, and to lessen the chance of the ruler slipping,move your hand along the ruler when making long cuts. Only cut 6-8 inches before moving your hand along the ruler. If you have a large enough mat, for the fabric to lie completely on it, then turn the mat so that the cut edge now lies along the side closest to your body. 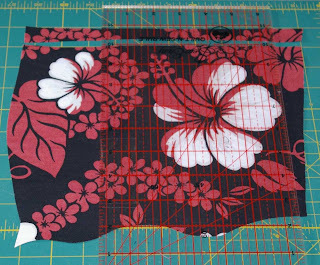 If your mat is smaller, then simply turn the fabric lining up the cut edge with one of the marked lines on the mat. 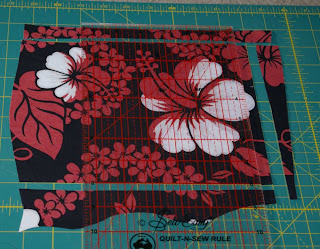 Line up the cut edge of the fabric with one of the lines on your ruler. Slide the ruler so that the edge is near the edge of the fabric and lies along one of the marked lines on your mat. Taking care cut away the excess fabric. Rotate the fabric and mat again. and repeat the above steps. Yes I know the terminology is all about poker but that is just what it seems like these days. Richard just received notice that Harvard has offered him a Knox scholarship. This will pay his tuition, health and provide him with enough money to cover living costs for two years after which if he has maintained his marks he will receive some other funding. Just can't believe it. I'm glad I don't have to choose. 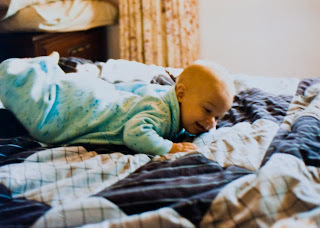 He loved what Johns Hopkins offered and now will need to find out exactly what Harvard are offering in in the line of studies. should be interesting. Quilt Campus has picked up one of my quilts for an online class. They think that students would enjoy making Confused Wells as it uses scraps.... hey most of my quilts these days use scrap... I have so much of it I can't seem to get around to using 'good' fabric as they say. Luckily I taught it to the Gerringong quilters last week and so was able to take lots of pictures to show each step. 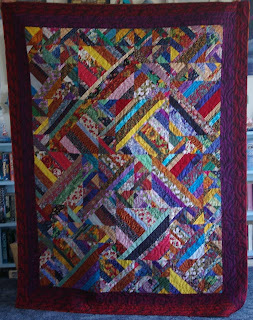 I wasn't in the mood to make another one at present as I have so many half finished quilts.. again!